Fido Fest 2019 - Turkey Creek - H.A.L.T. Pinnacle at Turkey Creek is hosting their third annual Fido Fest paw-ty, an outdoor event celebrating our four-legged furry friends, presented by Radio Systems Corporation. 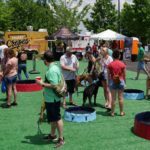 Fido Fest will feature food trucks, live entertainment and a wide array of dog-related activities, including a pet caricature artist and puppy splash zone. HALT and some other area rescue groups will be there!